Since Manx operates a complex and diverse network including wireline telephony services and the latest 4G wireless services, the operations team had a high number of element management systems and disparate views from their existing systems. This amalgamation of content and data resulted in a lack of visibility of an end-to-end service management capability. The rapid growth in mobile demand meant that Manx had to simultaneously build and deploy new technologies, whilst still managing its existing services. The continuous reorganization of priorities resulted in limited operational success and service quality. A key challenge was the incapability to process all the metric data being produced by the network. As a result, Manx needed a solution to better visualize data in dashboards and reports. 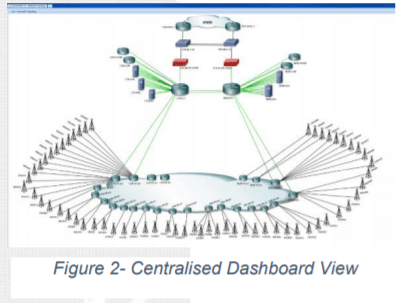 It was necessary for Manx to view relevant performance statistics across their Radio Access, Mobile Switching and Packet Switched Core Networks. The Huawei M2000 network element manager provided some of this functionality. However, Manx needed to present statistics on a single platform viewable by all levels of support and management. These challenges were met with AssureNow and Galileo Vision. Eirteic partnered with Manx to provide an end-to-end mobile service assurance platform through the implementation of AssureNow and Galileo Vision. 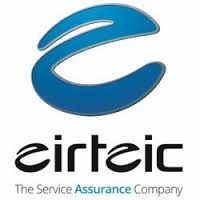 Eirteic configured AssureNow to collect all faults and vital radio access stats including 2G, 3G and 4G cell level, packet switch core and mobile switching metrics from the element managers and directly from devices. This solution enabled Manx to unify and simplify the data into a single view. AssureNow’s proactive alerting enabled Manx to identify systemic issues in the mobile environment before they impacted their services and users. Galileo Vision was deployed to enable the visual correlation of infrastructure and service issues (fault, performance, usage and service status) based on location and environmental factors such as adverse weather and electrical outages. 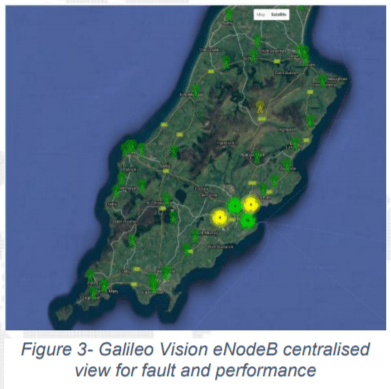 At Manx, Galileo Vision was configured to visualise the status and coverage of each eNodeB indicating current fault, performance and usage status. This solution enabled Manx to improve its mobile-user experience by highlighting the existence of and assisting in investigating the root cause of potential service outages and degradations. 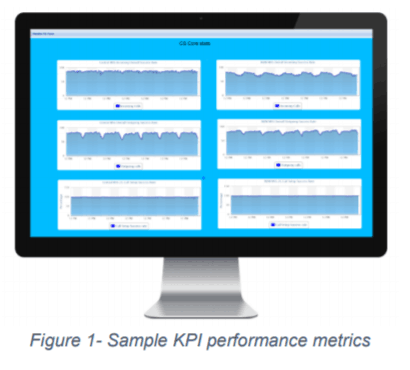 Fault and performance data was unified into a single mobile service assurance solution. The solution presented administrators with a simplified, realtime view of service quality indicators. This enabled proactive problem resolution and prevention, even in complex, cross-domain scenarios e.g. from the RAN to the backhaul to the core. The adoption of a multitechnology, multi-vendor solution from AssureNow has enabled Manx to optimise TCO and reduce Opex through the consolidation of OSS tools whilst refocusing users and staff.